This comprehensive worksheet can be used with the surface fire behavior lookup tables, the Nomograms and Nomographs, as well as BehavePlus, and runs if you want a paper copy. Consider using this as your briefing documentation by including a weather forecast narrative, your thoughts about recent fire activity, your sense of how accurate the predictions seem, and when you expect changes through the burn period. A Worksheet (above) designed to document a complete assessment for surface fire behavior and growth using either the lookup tables or the nomographs. 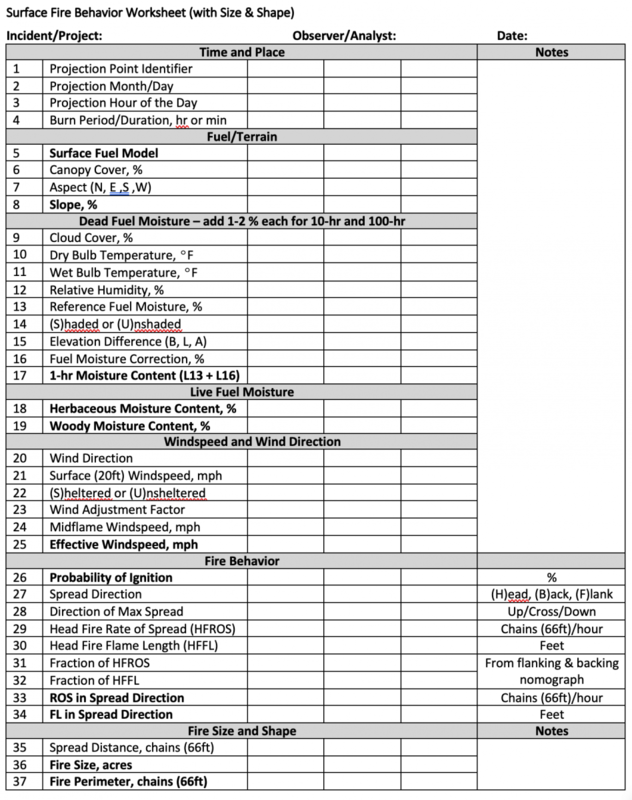 EWS Tables for estimating Effective Windspeed from Slope and Midflame Windspeed. The Effective Windspeeds that result from these tables assumes that wind is blowing ± 30° from upslope. For other situations, manual vectoring using the EWS Table would be necessary. 10-hr and 100-hr moisture values of 6% and 8% are used in the lookup tables. The *20ft/FCST wind line is provided as a convenience, but only works with stated Wind Adjustment Factor (WAF) & no slope adjustments. Backing & flanking columns are only rough estimates based on ½ and 1 mph windspeeds. Use the Flanking and Backing Fire Behavior Nomograph , or BehavePlus for more precise estimates. Instructions for Surface Fire Behavior Nomographs and Nomograms. Flanking and Backing Fire Behavior Nomograph for estimating rate of spread and flame length where fire is spreading more slowly on the flanks and at the back of the fire perimeter. Windspeed and Direction from Estimating Winds for Fire Behavior Section (20 ft & Midflame) and (Effective Windspeed Section). 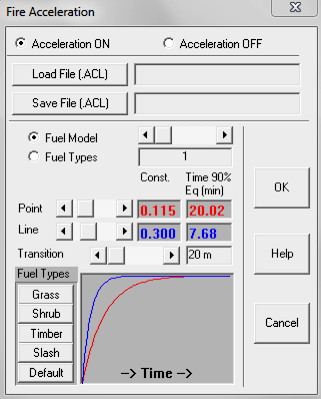 Fuel Model from Fuels Section (Surface Fuel Model, Canopy Fuel Characteristics). Dead Fuel Moisture from Fuel Moisture Section (Temp, RH, Month, Time, Elev Diff, Shading, Slope). Live Fuel Moisture from Fuel Moisture Section (Herbaceous Moisture Content, Woody Moisture Content). Slope and Aspect from Mapping Section (Map and Field Measurements, Slope Estimation). Time and Place from Fire Assessment Section (Verification, Calibration, and Validation, Burn Period, Duration). Rate of Spread is useful in fireline tactical applications; identifying what is at risk in the burn period, escape route limitations. Flame Length/Fireline Intensity is used generally in determining what tactics make sense during the peak burn period, interpreting safety zone concerns, and suggesting spotting potential. Heat per Unit Area is available from nomograms and BehavePlus. Like the Energy Release Component, it may be helpful in suggesting burn duration and fire effects. Fire acceleration is defined as the rate of increase in fire spread rate. It affects the amount of time required for a fire spread rate to achieve the theoretical steady state spread rate given 1) its existing spread rate, and 2) constant environmental conditions. Because initiating fires can take 20 minutes to over an hour to reach a steady spread rate, fire behavior and fire growth can be significantly reduced in the first burn period, and when beginning to spread in subsequent periods. At this time, fire acceleration is implemented only in FARSITE, using the model developed for the Canadian Forest Fire Behavior Prediction System (Alexander et. al. 1992). It is active by default, but can be turned off as a model input. As implemented, inputs are segregated by type of Ignition (point vs. line source) and potentially by fuel type (grass, shrub, timber, slash, a default, or by fuel model). Grass fuels are expected to have more rapid acceleration rates (shorter time to reach equilibrium) than fuel types with larger woody material (slash, etc. ).